The hubby and I currently live in an apartment that has a teeny, tiny kitchen. On the rare occasions that both of us need to be in there at the same time, it gets ugly. Like that one time he bumped into me on the way to the refrigerator as I was reaching into the oven to remove our finished meal. My arm jerked forward, the tray fell, my finger was burned and I was FUMING. As I stormed from the kitchen spewing swears… (can walking three feet out of a room count as storming? )…Mike saved dinner from the broiler. My dream kitchen has enough room for two cooks, lots of storage and steel! It’s so simple and clean. 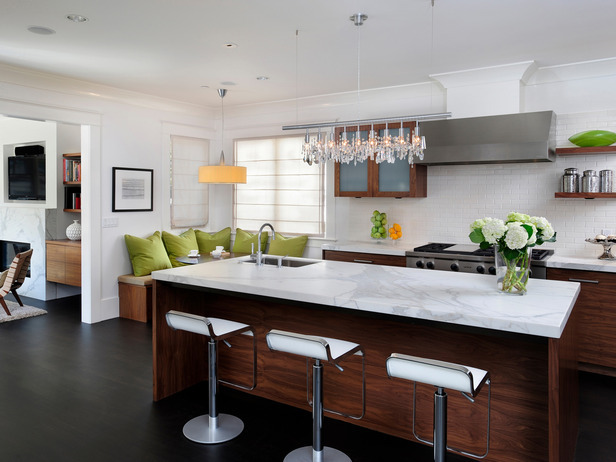 I love kitchens that look refreshing, and this one makes the southerner in me want to make a fresh carafe of iced tea. Earl, I like your idea of a dream kitchen, very nice! Love the pops of green in your Kitchen Inspiration. Haha, I know what you mean about a tight kitchen! My first apartment's kitchen was literally the size of a closet, a small closet! thanks for the comment, I've having a lot of fun too! Ahh I'm dreaming of a beautiful kitchen too!